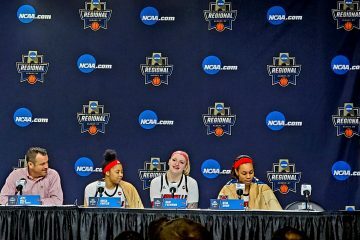 It was the women’s basketball team’s turn to honor The Greatest on Thursday night at the KFC Yum! Center, and they did so in dominant fashion. To adopt and adapt a phrase, it was pass like a butterfly; sting like a bee. 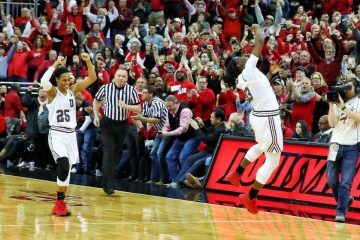 The Cardinals would punch often and early to ensure the KO in a 76-51 victory over #15 Syracuse. 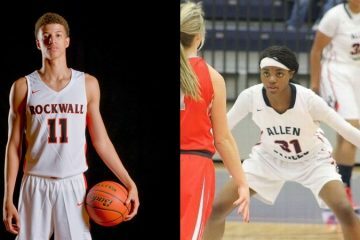 The prediction was for a rain of threes and both teams did not disappoint. 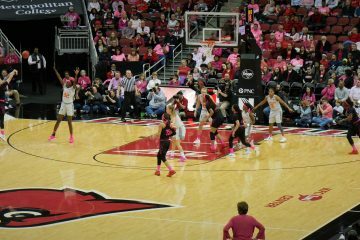 Asia Durr would open scoring with a quick three pointer, scoring the Cardinals’ first eight points on her way to lead all scorers with 15. Louisville would extend the lead early in the first quarter before Syracuse could heat up from beyond the arc. The deficit would prove to be too much and the Cardinals would cruise to victory, besting Syracuse from beyond the arc by shooting 10 of 27 to the Orange’s 6 of 24. Dana Evans would contribute with four of Louisville’s threes to earn her twelve points for the night. I’m sure there’s some quote from Sun Tzu about turning your enemy’s strengths into weaknesses. I don’t know it and I’m too lazy to look it up. But a Syracuse team that prides itself on perimeter shooting and ball movement found themselves outscored from three and losing the assist/turnover battle. Syracuse would mount 11 assists to 17 turnovers while the Cards handled things properly with 22 assists and 12 turnovers, garnering 25 points off said turnovers. The Orange? They had three points off turnovers. But Syracuse standout Tiana Mangakahia was doing all she could to keep the Orange in the game. Yet all too often she found herself deep in the trees forcing up tough shots against the likes of Shook, Fuehring, or Dunham. Her six assists did little to help as the Cardinals easily shut down the passing lanes, garnering seven steals in the process. Mangakahia averages 15.9 points per game but was held to five on the night. Redshirt sophomore Kiara Lewis was once again a contributor for the Orange off the bench, netting 13 points to lead the Orange in the losing effort. Despite the Orange’s scoring woes, they would attempt to mount a run by starting the third quarter with an 8-0 run. Walz would, as he often has, let his squad work out the second half kinks and indeed they did not disappoint. Walz would say that assistant coach Sam Purcell refers to the sluggish starts to a quarter as “smoke breaks.” Well, lectures about good health aside, Walz refused to bail his team out despite being urged to do so. Fortunately, the Cardinals adjusted quickly with an 8-0 run of their own thanks to the interior strength of Fuehring, Jones, and Shook and it was never a contest after that. But let’s take a second to talk about Kylee Shook. 12 points, 11 rebounds to notch her third double-double of the season. 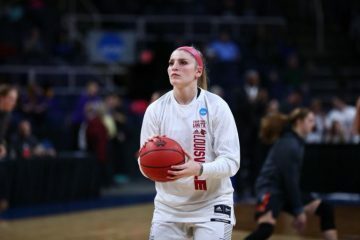 Fuehring and Dunham would both spend time on the bench after picking up their third fouls early in the third quarter, and Kylee would hold court from there on out. Shook has definitely found her groove, even after spending most of the game against UConn on the bench. 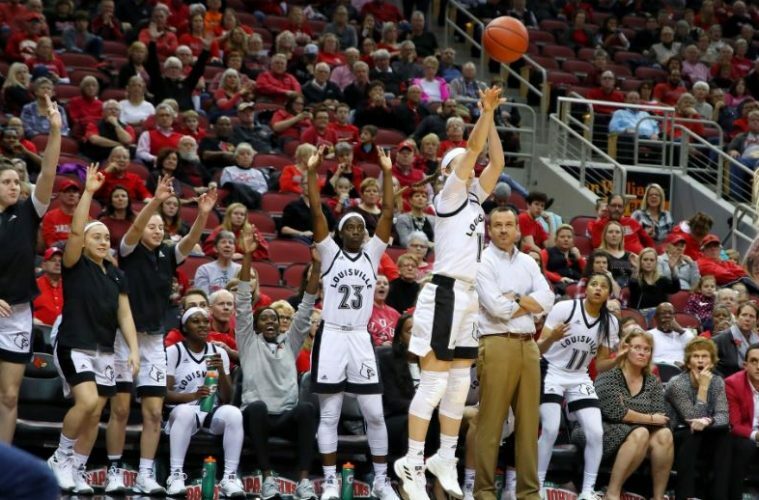 Walz said the game against the Huskies was simply not a good match-up for Shook, and credits her maturity for taking it in stride and coming out strong against Clemson. Shook continued the aggressive streak tonight and earns top honors. And yet this game smacks primarily of team effort. Eight Cardinals would score; three of those in double figures. Dana Evans continues her stellar rise on 4 for 7 from three with 6 rebounds, 4 assists, and 4 steals. Asia Durr had an off night, scoring a mere 15 points with 4 assists. With Shook leading the way, the Cardinals would combine to win the rebounding battle 46 to 38. Going into March, Jeff Walz should count his blessings to have a veritable Swiss Army Team with so many weapons. Oh, and by the way. As the Cardinals were squeezing Oranges, Notre Dame and NC State would go down with losses. The Cardinals now have sole possession of first place in the ACC with a 9-1 conference record. When told about the Irish and Wolfpack’s losses, Walz simply said, “There’s a lot of games left.” And yet March is just around the corner. Next up, Virginia Tech in Blacksburg this Sunday at noon.